It catches your attention as you're scrolling through Facebook. The post claims "Delta Airline is gifitng (sic) 2 free tickets to everyone! 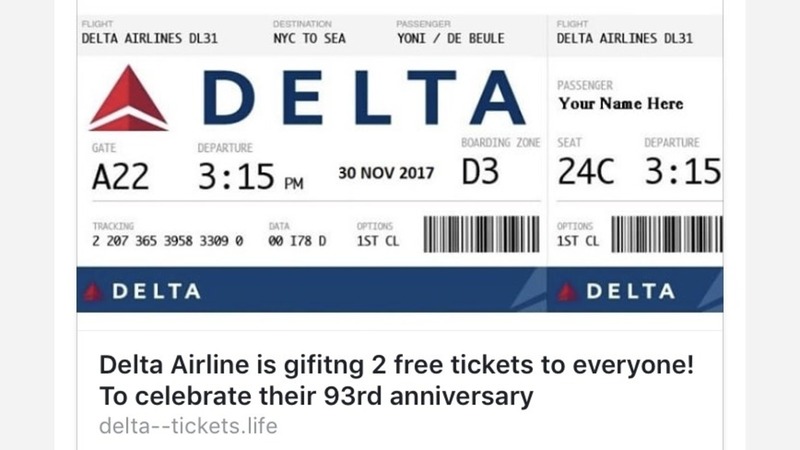 To celebrate their 93rd anniversary"
The post is not only filled with grammar and spelling errors but Delta said they have nothing to do with it. If you click on the Facebook post, it leads you to a quick survey. Once the survey is completed, you are asked to like and share the link on Facebook, but you never receive the tickets. You should know, sharing fake links or pages on social media allows scammers to collect user data and collect a profit. The easiest way to spot a fake link is to see if the link uses "https" not "http." Only secure sites will have "https" in the link. Delta provides this website that details the attempts by parties not affiliated with them to fraudulently gather customer information. The company suggests if you have been contacted by one of these parties and provided information to them, you should change your SkyMiles account password immediately and monitor your account for any misuse.